To Sophia Duleep Singh, suffragette, women's rights activist, campaigner. From June Westley. I had never heard of you until Anita Anand wrote your biography. You were quite amazing. A princess from the Punjab, you were a goddaughter of Queen Victoria & came to live in England when Britain took over your country as part of the Empire. You became an active suffragette, though couldn’t get arrested with your companions because this would be bad publicity for the Government, which was trying to quash the suffrage movement. Nevertheless you kept protesting & achieved other benefits eg. for the Sikh sailors who had been abandoned in London, with no means of support. suffragette, women's rights activist, campaigner. Born 1876, died 1948. 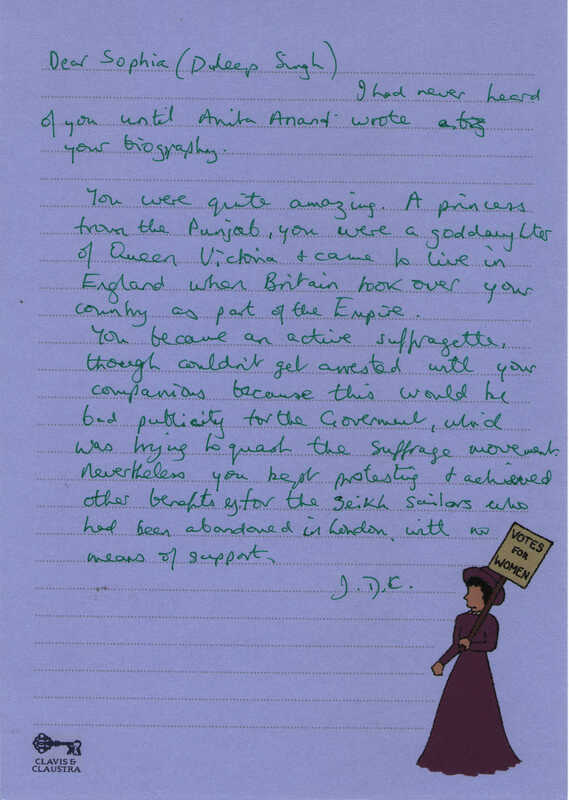 More information about Sophia Duleep Singh.